During the 1950s scientists, using sensitive instruments called magnetometers, began to recognize strange magnetic patterns across the seafloor. This finding was not entirely surprising because it is known that basalt—the iron-rich volcanic lava making up the seafloor crust—contains a strongly magnetic mineral called magnetite, which can locally distort compass readings. More importantly, because the presence of magnetite gives the basalt measurable magnetic properties, these newly discovered magnetic patterns provided an important means to study the distribution of volcanic lava throughout each of the oceans. As more and more of the seafloor was mapped during the 1950s and 1960s, these magnetic patterns turned out to be not random or isolated occurrences but instead revealed a predictable zebra-stripe like pattern. These stripes were in turn found to be symmetrical about centrally located mid-ocean-ridges. Symmetrical magnetic striping across a small part of the North Atlantic Ocean centred over the mid-ocean-ridge showing a progressive opening and increase in surface area of the seafloor crusts. From this mapping, alternating stripes of magnetised basalt lava were shown to be laid out in parallel rows on each side of the mid-ocean-ridge, where one stripe showed a normal magnetic polarity and the adjoining stripe showed a reversed polarity—caused by periodic changes in polarity of the magnetic poles. While the magnetic stripes were initially not linked to inversions of the Earth’s magnetic field, this connection was later explained by Vine and Mathews in 1963. 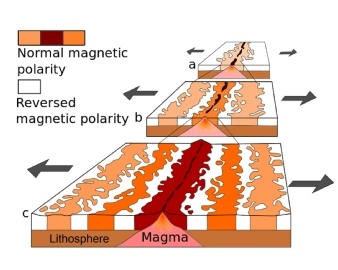 The overall magnetic pattern, as defined by these alternating bands of normally and reverse polarized lava, then became known as magnetic striping. The discovery of this symmetrical magnetic striping pattern suggested a close relationship between the mid-ocean-ridges, seafloor spreading, and the formation of the stripes. Seafloor spreading, as it later became known as, was first recognised by Carey in 1958 and again by Heezen in 1960. In 1961 scientists began to theorize that the mid-ocean-ridges mark structurally weak zones, where the seafloor was considered as being “ripped apart” lengthwise along the crest of the mid-ocean-ridges. From this, it was suggested that new volcanic lava from deep within the Earth must rise through these structurally weak zones to eventually erupt along the crest of the ridges and cool to form new basaltic seafloor crust. 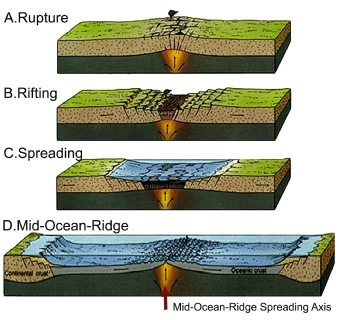 Schematic cross-sections showing structurally weak seafloor crustal zones opening along the crest of a mid-ocean-ridge to form a new ocean. It was further appreciated from dating the ages of the various newly formed seafloor crustal lavas that this seafloor spreading process has been operating over many millions of years. Subsequent mapping has shown that this process is continuing to form new seafloor crust along the entire 65,000 kilometre-long system of centrally located mid-ocean-ridges, now known to be present throughout all of the oceans.